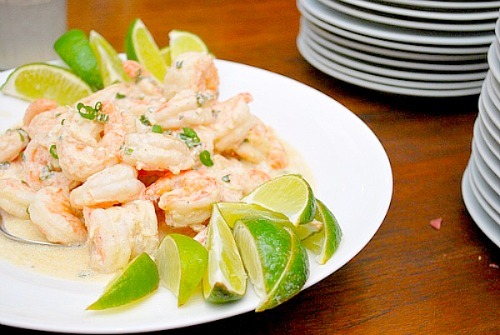 These are happy shrimp... swimming in a creamy sauce of tequila, lime and a touch of sour cream. It couldn't be easier to prepare either. The shrimp are first tossed with sliced green onions, lime juice, salt and pepper. Then they hit a pan with butter to sauté a bit. For a little show, tequila is added and flambéed just until the alcohol is evaporated. Sour cream is stirred in for that creamy sauce and just before serving, a sprinkling of chile powder finishes the dish. Serve up with fresh lime wedges, this is a recipe perfect as an appetizer or made into a main dish with accompanying sides. Heat butter in a 12-inch heavy skillet over medium-high heat until foam subsides, then sauté shrimp, turning, until pink and just cooked through, 3 to 5 minutes. Reduce heat and add Sauza blanco, then increase heat to medium-high. Tilt skillet over gas burner to ignite tequila (or ignite with a long match; use caution, as flames may shoot up high). Cook, shaking skillet gently once or twice, until flames subside. Remove from heat and stir in crema. This recipe sounds very doable but having just gotten over repairs from a kitchen fire, I cannot fathom lighting this baby up! Is there an alternative to flambeing? I loved the idea but even my grill sets my fire alarm off, what a shame!! !